Why choose Pro Window Cleaning? Protect your business by using a licensed, uniformed and insured company. We have 27 years of experience and over 1 million windows under our belt. Get your windows clean faster because we can be there within 24 hours. Get rid of the dirt by Monday with our day-and-night weekend service. We won’t bore you with the details, but we use only the most modern tools, techniques, and cleaning agents. No one hates dirt on windows more or will get them cleaner than us! Get a quote today, call 816-920-6943. Hot water pressure washing – Our 6 step pressure washing procedures work wonders for your buildings, sidewalks, parking lots, drive thru and dumpster areas. We use water under extreme high pressure (up to 3000 psi) to remove dirt and lighten stains to restore surfaces to a cleaner, newer appearance. Surface cleaning – Our powerful Twister Surface cleaners cut 3 foot clean paths. They clean concrete better and faster than any other machine. If you think your parking lot is hopeless, give us a call. 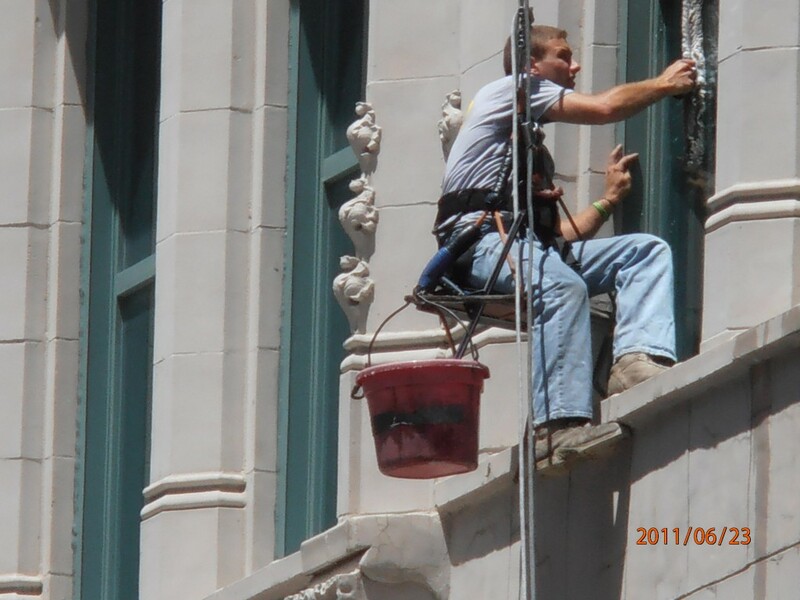 Construction cleaning – of windows and frames. You won’t believe how great your windows and frames can look after a thorough construction cleaning. Liftwork – With our trailer mounted z-boom, we can get to those hard to reach areas – up to 56 feet – both inside and out. Parking lot lights changed – 24-hour weekend service helps protect your employees and clients. Application of concrete and brick sealant – Essential to protect your concrete surfaces and brick, sealant provides an invisible barrier against moisture and mold and keep your surfaces looking fantastic! Glass restoration – For a fraction of the cost of replacing expensive or specialty glass, we can restore it to near original condition. Bird netting and repellant services – Help eliminate the problem of infestations.. and prevent any future bird problems. To get a quote or schedule a free demonstration of one of our services, call 816-920-6943.